My hair is bob-length and I want to wear it down on my wedding day. I'd like to wear a hair comb in it to the side I think, but I can't find any pictures anywhere on the internet of what this might look like - they're all of long hair and I don't think it would work in the same way. Does anyone have any suggestions of where I can look for advice? I'm exactly the same! My hair is bob length and I cannot find any pictures!! Don't know if this gonna be much help but I am loving Katie Holmes' hair at the mo (in fact I'm growing mine quite long for my wedding but gonna get a bob again after seeing Mrs. Cruise's new 'do'). I wonder if you search her in google images there might be some pictures of her with it pinned up in places. Love the idea of a comb at the side - sounds very vintage! Gorgeous! Hope you get some better advice off other people! i'm having the same issue, my hair is a bob too, and the bridal magazines feature just "up-do's" it's very frustrating! I am going to try and find a hair-band that has something on the right hand side either feathers, beads or such like?!? I can't believe we're all having the same problem! there must be an answer out there! Flutterbry - thanks for the Katie Holmes suggestion, you're right, she has great hair so she's worth a look. I've looked through loads of bridal magazines but so far don't think I've found one picture of bob-length hair! Catcook - that's pretty much what I'm looking for too, good luck with it, hope you find something good. Don't know if this will help but Honey out of eastenders has wore her hair with a flower in the side before and it looked fab. Hey goldilocks... That is absolutely stunning! I really need to go to bed right now, but I want to say ME TOO!! What has the bridal industry got against bobs?!?!?! I wouldn't mind, but since posh et al had bobs, its so popular right now!! Hi guys, i am same. Hair in a bob. For a while i thought i would just wear it down in my normal style but my BM convinced me to do something more interesting. I found a pic in an old wedding mag which i'm going to cling to for dear life. Is short bob curled in a kind of forties way with side parting and hair clip in one side. Am gonna look for a nice hair clip or poss have a fresh flower to match my bouquet. 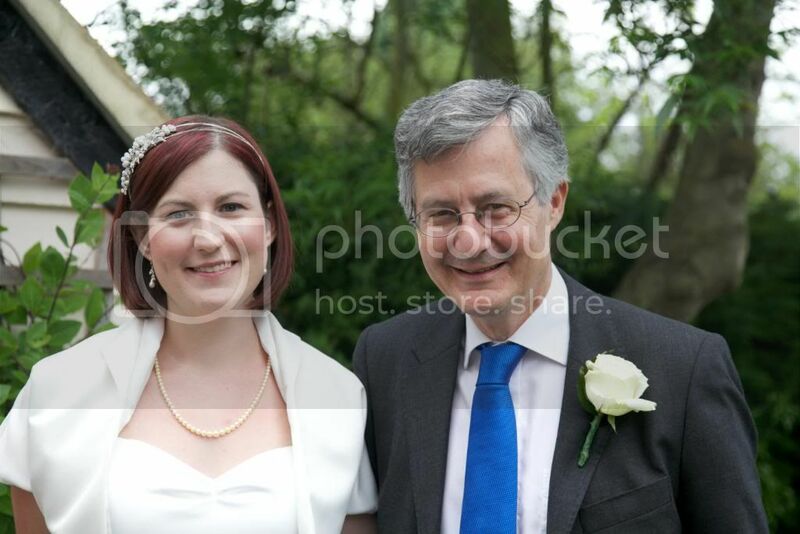 Totally agree that there are hardly any pics of shorter haired brides. I toyed with the idea of growing it but it's just not me. Good luck, girls, for finding your perfect look with your bobs! I miss my bob (I've been growing my hair for the last year now), and can't wait to get it chopped off to how I like it! A lovely fascinator like that of mrvenn2be sounds like a perfect solution. My last wedding, my hair was in a bob and I bought a nice side comb and just had one side combed back which looked really nice. Buy a cheap comb and have a practice and get used to it, or take it to your hairdresser the next time you go and see what she can do with it. I dont know if you saw dont tell the bride the other night on bbc3, the bride had bobbed hair and it was lovely. She had it all sweeped over, with it backcombed for a bit of height and then had a flower type corsage in it. I really like it. I cant see any photos just a link to watch it. Was alex and kara. Hope that might help. I had my long hair cut into a short bob for our 1920's inspired wedding. I wore an alice band like hairpiece in the day and a huge feather flapper style headband in the evening. I took a lot of my inspiration from vintage sites rather than conventional hair magazines. Try looking on sites that specialise in vintage style jewellery such as Queens and Bowl as well, and keep your eyes on blogs like love my dress for inspiration! Hope this helps!